After teaching Chinese watercolor to numerous Chinese and American students over the past 40 years, Ms. Li feels “obligated” to discuss this subject of How to Think, Explore and Learn. Perhaps you’ll find similarities between strategies discussed here and other mediums such as oil, pencil, or even sculpture. As a professional artist, Ms. Li has been trained in various mediums as well as Asian and Western techniques. She hopes to speak to not only Asian artists but artists around the world. In this example below, we’re showing one approach used in Ms. Li’s art workshops with children and adults. Depending on the student’s ability – more advanced/experienced students will begin with a blank piece of watercolor paper, whereas beginners/less experienced students will be provided with a pencil-sketched outline. In this blog post, we’ll not be discussing the step by step process of how to recreate this painting (you’ll find a future post for this purpose). Instead, Ms. Li wants to teach (and perhaps remind) her students how to Think, Explore and Learn on their own. Ms. Li’s workshop typically runs for 1.5-2 hours. That is not a ton of time compared to some other traditional art workshops / trainings. Some of Ms. Li’s students jokingly referred to her class as “speed-dating” or “painting on steroids”. The pace is fast and students are expected to follow instructions as well as exploring on their own. Ms. Li’s focus is for students to really learn and execute the techniques. As an artist (and especially an art student), you need to be open-minded, acceptable of imperfections and wiling to make mistakes. “Imperfection” can often be subjective. Ms. Li noticed that some students try too hard to make their paintings appear exactly like hers. Though at times this effort may be helpful, it can also be a roadblock and takes away what the student can see in his own painting. Everyone is different and this is especially true in art – you may have noticed that certain concepts, techniques come to you easily, while some others take a while to digest and sink in. As an art student, Ms. Li suggests that you practice more – not only in class but also when you are alone at home. Art students should try to create a quite, peaceful and nonjudgmental environment to practice in, be proud with their strengths but more importantly, be patient with their challenges. Practicing art is not about showing off – if you are only attending workshops to showoff in front of the instructor and other students, then you are not learning anything. Observe carefully and trust your instinct – before you ask a question to the master instructor, have you thought about potential answers? 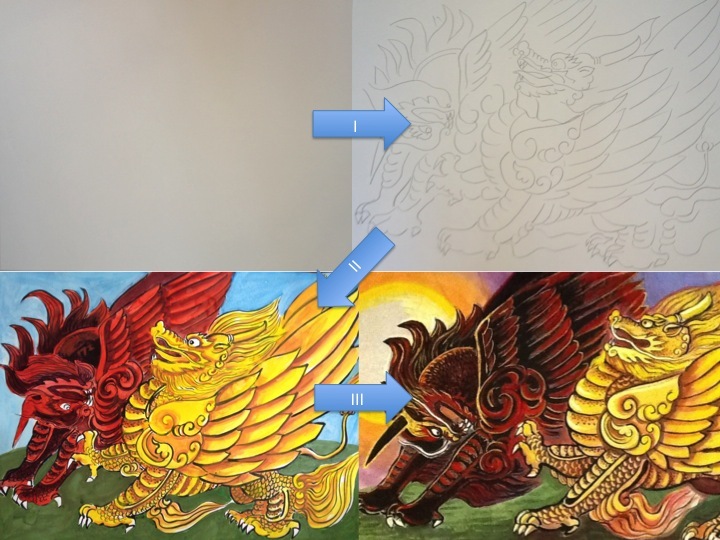 Did you observe the finished painting (or a work in progress teaching material) carefully? Could you make some assumptions? Ms. Li believes that observation is not only important but a key factor in learning. Ms. Li recalls attending local artist galleries as a young child at the age of 4 or 5, she always tried to guess and mimic (in her head) how some of the artists achieved the effects: Did he combine the 2 colors – is the color on the tip of the brush darker or more concentrated? Did he apply wax to paper so that the watercolor wouldn’t come through in certain areas? How did he use shadows only instead of concrete lines to create the entire figure? You’ll be surprised by your answers – if they align with exactly what the artist did (well done! ), or you may just be on your way to find your signature technique. Don’t just observe, think for too long, try them out – there’s no better lesson than doing – your instinct, thoughts can only come to life once you bridge the gap by practicing with your hand on paper. If you are feeling nervous especially toward the end of finishing a painting, take a break and come back when you are feeling more confident, refreshed. If it’s a new color you want to try out, Ms. Li suggests some extra paper (or even paper towel) on the side to test them first. You can learn from everyone around you – seasoned, amateur and not-by-title artists. Don’t forget to consider strategies discussed in “Think” and “Explore” above. As you witness paintings, billboards, photography, TV shows, album covers that interest you, ask yourself what it is that intrigues you, what you can learn from it, and how you could recreate it if you so choose to. Learning is a life-long journey – there’s no limitation to learning whether it’s age, physical or mental limitations. Ms. Li recently learned from a Director at Northeast Arc in Peabody, MA that a member with a muscle condition is only able to move his thumb, and with that he has completed numerous artworks with the support from caretakers and a sensor touchpad. What is your excuse? Unlearning (certain behaviors) is also important – often times as adults, we’ve picked up behaviors and thinking patterns that are difficult to unlearn. Many of them are influenced by people around us – it takes courage and time to revert bad behaviors. Ms. Li loves running an art workshop filled with students who are willing to learn and help each other. An environment that is outside of your direct network may help you progress faster. Have a purpose and a vision – this concept may be more useful for artists who are tailoring their artworks, designing something rather unique for sale. So you delivered the work and feel great about it, but the client returned with a list of ridiculous, and sometimes conflicting feedback?Before you implement the feedback immediately and blindly- think and then have a great discussion with the client (in person or on the phone – if you choose email, then describe your purpose and vision clearly to avoid back and forth). What was the purpose and vision for your design, does s/he fully understand where you are coming from and why you made certain design decisions? Though you may not be able to push back on some feedback, it is still important for the client to hear your point of view, especially if you are planning to partner again in the future. My partner and I stumbled over here from a different page and thought I might as well check things out.